It is time for another weekly challenge over at the Glitter 'N' Sparkle Challenge Blog. 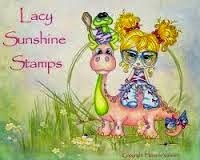 Our First Sponsor is: Lacy Sunshine who is offering 3 image from their store. 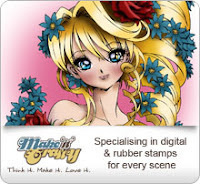 Our Second Sponsor is: Make It Crafty who is offering a $10 Gift Certificate. Our Third Sponsor is: Scribbles Designs who is offering a $10 gift certificate. For my project this week I was asked to select an image from Make It Crafty - so many to choose from!!! I chose Summer Dreams. I have been drawn towards colouring on Kraft card stock recently so thought this would be the perfect image to do this with and to use both Copic markers and Pencils. I used Prismacolor pencils for her hair and the rest was coloured in Copic markers. The sentiment is from Paper Smooches set - can't remember the name but it is the one with the cute rainbow and unicorn. I added some metal in the form of my seashell charm, and of course used my favourite colour - PURPLE. Hope you get a chance to play along with us this week for your chance to win some great images!.